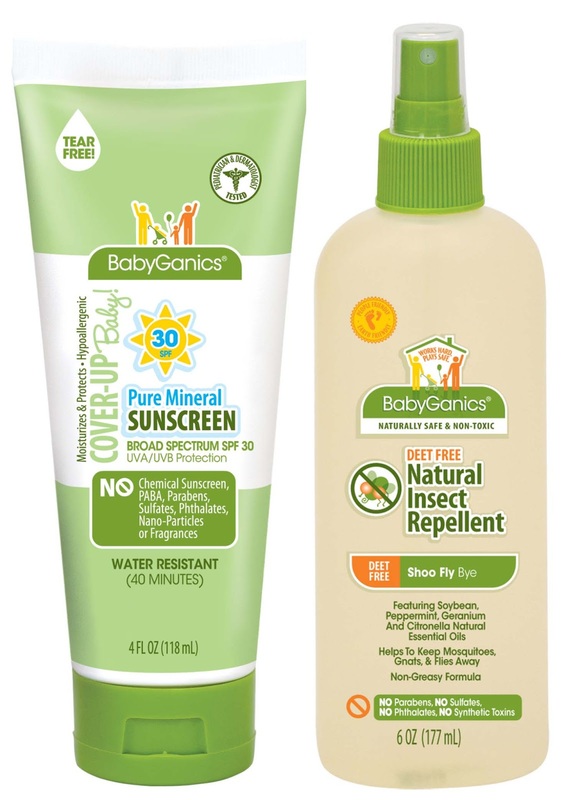 Disclosure: BabyGanics sent us sunscreen and bug spray samples to review, and they will be sponsoring the giveaway prize. All opinions expressed below are my own. It's summertime - and the children are restless. Even though mommy might prefer to stay inside where it is a blissful 68 degrees, my little munchkins are thrilled if we make it out the back door - even if they freak out when they see a sprinkler. Whether we're looking for a backyard adventure or an epic trip to the zoo, I am usually worried about sun exposure. I want my kids to spend time outside, but I don't want to end up with anyone else being treated for burns - especially after our coffee disaster. I also don't want to slather my kids in harmful chemicals and toxins! It's kinda sunny out here, Mom! I'm more than a little bit concerned about the ingredients found in a lot of typical baby/toddler products and was happy to give BabyGanics a try. We are happy with what we've found so far - and I'm thrilled to share these products with you! After Lincoln's coffee burn earlier this year, we have had to pay extra close attention to how much time he spends in the sun. His skin has healed, but is a lot more likely to burn without sunscreen. I was so relieved when we received this sunscreen! The pure mineral and non-chemical format of this 30+SPF lotion offers broad spectrum UVA/UVB protection. It's a lotion, so it moisturizes too! It comes Pediatrician- and Dermatologist-tested and recommended and features NO Parabens, Sulfates, PABA, Phthalates, Nano-Particles, Retinyl Palmitate, Mineral Oil, Petrolatum, Artificial Colors, Synthetic Fragrance, Gluten, or Nuts (can we say wow?)! It can be purchased at BabiesRUs and Diapers.com. When we played in the sprinkler a couple weeks ago, I failed to use bug spray at all. And I paid for it. While the kids miraculously managed to come inside unscathed, I had a giant bite behind one knee and another on my stomach (thank you, baby who couldn't wait to nurse until we came in). This DEET free spray is made up of essential oils that frighten pesky insects away yet smell pleasant to humans. Peppermint, geranium, soybean, and citronella are a whole lot less toxic than a "normal" bug spray! 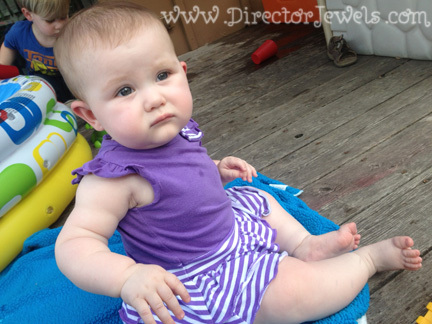 You can find Shoo Fly Bye at Babies R Us, Buy Buy Baby, Target and Diapers.com. We were also sent a sample pack of these nifty single use sunscreen tubes. While this is not part of the giveaway below, I have to tell you - these are my favorite thing. 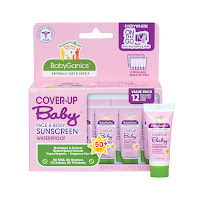 They are perfect to throw in the car or diaper bag as a backup in case you get to your summery destination and realize you don't have any sunscreen! 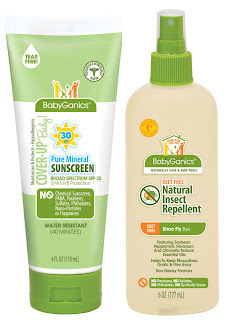 I keep one in my stroller and it's perfect for giving a little sun protection when we're on a family walk. LOVE THEM! You can keep up with BabyGanics on Facebook, Twitter, Pinterest and YouTube for all the latest news! 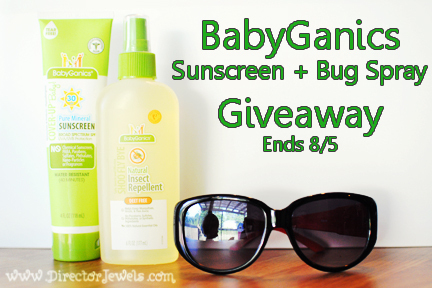 One Director Jewels reader will win a bottle of Shoo Fly Bye: DEET Free Bug Spray and a tube of Cover Up Baby Pure Mineral Moisturizing Sunscreen Lotion. This giveaway will end on August 5 at 11:59pm CST. This giveaway is open to US readers only. Thank you to BabyGanics for providing my review sample and the giveaway prize! I received no other compensation and all views expressed are my own. For more information, you can read my Giveaway Policy and my Disclosure Policy. I love hanging out in the pool with our little dude! <3 Great giveaway! We get outside as much as possible! we are spending a lot of time in our pool! We are sadly not spending a lot of time in the pool as it is SO far that it's too hot to walk to reasonably (2miles) and we only have one car :( but we are hanging out outside a lot and hiking a lot on weekends! We are spending the summer mostly inside... loving the library! But we could have used some healthy sunscreen earlier this week at the water park! My kids are in ABA school for autism all summer but we swim afterwards a lot and they are doing swim lessons. I am on the hunt for safe and natural products so thank you. I am also new to your blog. What a nice blog. I've been spending the summer taking weekend trips to the beach with my husband, we even visited Charleston for a weekend which was nice! We're expecting our first baby (girl!) this fall. Thanks for the opportunity. i love playing in the pool!